I have to tell you about Peter. Almost every one of his lessons he learned the hard way. But he learned. He is loyal through and through now. Sometimes his learning was hard on me too, but never as hard as it was on him. 'Go out again, and I'll come with you,' I replied. He stared at Me for what seemed hours. I didn't look away. 'Get in,' he finally muttered. So I did. Andrew and Philip did too. He had a right to be skeptical. The fishermen of Galilee fish at night for a reason. The lake is so clear that fish can see the nets in daylight. I waited till we were some ways offshore and then told them to cast their nets. Well, there were so many fish that the net broke, and then there was such a bustle of activity that I almost choked laughing. Peter hailed a passing boat, and we secured the catch with their nets. I guess it was a record catch for the lake. Peter just stared, with mouth agape, while it all sank in. Suddenly he threw himself down at My feet. 'Depart from me,' he said, 'For I am a sinful man!' Andrew was right about his brother! He is a good man. I loved him for that, because it told me that, despite his impulsive, assertive, blundering ways, Peter was letting My Father work in his life. That sort of response is not natural to flesh and blood! You know, the difference between blundering Peter and polished Judas was that Peter didn't let his defects come between us. He clung to Me as tenaciously as a vine to it's arbor, even when he felt most unworthy. Sometimes he seems like a contradiction in terms. Like that time he said, 'Depart from me, for I am a sinful man' while clinging to my feet. Some would say it was a contradiction for him to tell Me I must not go to Jerusalem shortly after he had declared I was God's Son. But it really wasn't contradictory. His intentions were good despite his confusion. When I rebuked Satan for inspiring that thought, the pain on Peter's face was almost too much for Me. It was like his best friend had just slapped him in the face. I wanted to throw My arms around him then and there, but I prayed for him. My Father knows how much I have prayed for him! I remember that at Capernaum a cluster of Pharisees pulled him aside and asked whether I paid the Temple tax. Of all the disciples, you would have expected him to know the right answer. Why, just a short time before, as I mentioned, he had acknowledged Me as the Son of God. Every Jew knows that as long as we have been a nation, prophets and holy men have been exempted from the Temple tax. I am sure he meant well and did not see the trap, because he loudly asserted that I was as loyal a Jew as the next guy and would certainly pay. Oh, it's great to think back on it all! 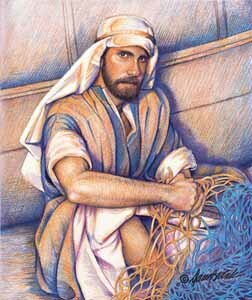 I remember one particular Sabbath in Capernaum when I was staying at Peter's house. His mother-in-law was sick. In fact, she was almost delirious with a terribly high fever. Peter's wife had died, you know, and you could tell he had loved her by the way he cared for her mother. Things did not look good! Peter epitomized the word 'anxious'. I wanted to help, so I healed her. It made the whole Sabbath extra-special to see the change of expression on his face when the fever left her! There was really no cause to worry. I fixed the cripple, and he and his friends fixed the roof. We were up late that night! I just couldn't say no to even one sufferer. The last one didn't leave till close to 2:00 in the morning. I got up at 5:00 a.m. to spend some time with my Father. Peter and the others slept in, but I prayed for them that their strength might fail not. You must have heard about that night on the Lake. Actually, there were two nights worth mentioning. The first took place after a particularly long day. I was so exhausted that I couldn't stay awake, so shortly after we were under sail I lay down in the bow of the boat. There is nothing quite as relaxing as the motion of a boat on water, and almost immediately I was asleep for the night. I must have been sleeping soundly, too, because the next thing I knew, Peter was shaking Me and screaming at the top of his lungs. It seems that a storm had risen, and we were being blown about. I'll never forget how beautiful the lightning was against that dark and cloudy sky. I was actually enjoying the brisk air and invigorating spray, but the others were in a panic. I stood up and said to the storm, 'Peace be still!' My Father took care of the rest and moments later the moon shimmered a path across the mirrored surface of Galilee. My friends just sat in dumb disbelief. They should have known there was nothing to fear. Even Peter was speechless. I said there were two nights worth mentioning. Here is what happened during the other one. It had been another unusually long day. In fact, we had ended it by feeding more than 20,000 people. Everyone got pretty excited about that meal, and I guess they wanted to make a big deal over Me because of it. They called it a miracle feast, but it was the same power those farmers see at work in their fields every day. I guess they don't consider a thing miraculous unless it happens quickly. Anyway, I declined the honors and had to insist that everyone go home. My closest friends were pretty upset, so I sent them out on the lake. I hoped that an evening on the water would settle and soothe their spirits. It's so quiet and peaceful out there! I stayed behind and climbed the hillside to a favorite overlook of mine, where I could watch the moonlight on the water. As the stars wheeled past overhead, I talked with My Father, and I have to say that if there's something more settling than a night on the lake, it's talking to Him. While I was talking and listening, a wind came up. I suppose gale would be a better choice of words, for it tossed my friend's boat about like a cork. I could see them from where I sat. The storm was good for them. They had talked themselves into a deep depression and needed something to divert their troubled minds. For about six hours they bailed and rowed against contrary winds. Finally, they gave themselves up for lost, and then the timing was right for Me to help. As you know, with My Father, nothing is impossible. I set out walking toward them on the water. At first they didn't realize what they were really seeing because the waves kept hiding us from full view of each other, but as I got closer, their minds were seized with unparalleled fear. They dropped their oars and sat frozen in mute terror. The wind was flailing My hair and robe, about and I guess they thought I was an apparition. They began thinking they were either dead men or soon to be such. I grabbed his upstretched hand and walked with him to the boat. If you've ever seen a puppy cower fearfully with its tail between its legs, then you'll know how poor Peter looked as he sat there cold and wet. If only he had learned then, that he was secure only as long as he kept his focus on Me. If only they all had learned that! During the late summer of My thirty-third year, we traveled north from Galilee, past Caesarea, to the base of Mount Hermon. For as long as I can remember, I have loved the mountains! Nazareth is a mountain town, and from atop the slopes above our woodshop, I used to gaze westward across the blue vastness of the Mediterranean. The peaks surrounding Nazareth were seldom higher than 3,000 feet, but looking north from their summits, I could see the snowfields of Hermon. It is over three times the height of our mountains and seems to belong more to the sky than the earth. I felt a strange kinship to that mountain, and I longed to climb it. It was late afternoon as we approached the base. We had been walking through dust and heat since midmorning, but cool downslope winds told of the snowfields and rarified air that we knew were higher. I felt new energy and My desire to climb would not be postponed till morning. Most of My friends were weary and decided to make camp, but Peter and the two Zebedee brothers shared My eagerness to press on. The mountain was calling us, and we had to go. We were more than half way up by the time the sun began going down. It cast lengthy shadows before us as the mountain warmed to gold. Sunset was glorious! The snowfields, reflecting sunlight, shimmered all the brightness of the day into one grand shower of diamond sparks! We stopped to rest and gaze as twilight settled down like a mist of lavender, and a powder of rose. No one spoke. I don't know how long we sat lost in contemplation, but it was long enough for our weary muscles to begin setting up. It took determined efforts to continue, but we finally reached the summit in darkness and exhaustion. The others were soon asleep. I could have put My finger on a star. I felt close to home there, and I spent the next several hours talking with My Father. One of the things I asked Him for was to somehow give Peter, James and John a glimpse of the glory that was Mine before the world began. In answer, He sent two from the World of Light, and the glory that accompanied them made the sunset pale to insignificance. It's hard to describe what followed, but I remember My friends waking up and trying to shield their eyes. It was one of those rare times when Peter was at a loss for words. Tabernacles! Those are shelters the pilgrims build when they come for Succoth. As if Moses and Elijah would leave Heaven to take up residence on Mount Hermon! I had to laugh. About then a brilliant cloud hovered over our heads, and My Father spoke. You should have seen Peter! He hit the ground face down like a dead man, throwing his arms over his head and shaking as though he expected to be struck by lightning. I reassured him and the others, but he didn't speak again until we had almost finished descending the mountain. Perhaps the thing I appreciate most about Peter is how quickly he repents when he knows he has been wrong. So many of My followers think they need to let My Father cool down before they can return after sinning. They should take a lesson from My friend Peter. He didn't let anything keep him away for long! And he didn't do anything halfway, either. He put his whole heart into whatever he did, right or wrong! There was the time that night we celebrated Passover in the upper room. 'You will never wash my feet!' he said, but moments later, he was just as earnestly begging Me to wash his whole body, after I told him what the symbol said about our relationship. Peter's instruction was not yet complete. The hardest lesson of his life came later that same Passover night. I would have saved him if I could, but he was so headstrong and self-assured there was nothing I could do. I tried to warn him. I told him he would deny Me that very night, but he didn't hear. He didn't seem to be listening when I said I would pray for him so that his strength would not fail, but that didn't prevent Me from praying. I knew that when he was converted, he would strengthen his brothers. We left the upper room and headed toward a favorite spot of Mine in the Garden of Gethsemane. Upon reaching the garden, Peter, James, John, and I left the others and went a bit farther. I asked them to wait and pray near a small grove of olive trees, while I went over to a nearby rock that was bathed in moonlight. The next few hours were the hardest of my life. The time was at hand when I was to be betrayed, mocked, and crucified. Everything within Me resisted the idea of death. I pleaded for another way, but it seemed Heaven could not hear Me. I had never felt so alone! I went back to where My three closest friends were. I wanted someone to talk to, someone to listen, but they were all sleeping. I must have looked as bad as I felt, because when I woke them, they were frightened and didn't recognize Me at first. When I told them that I felt like I was dying, they sat up and said they would pray for Me. Encouraged, I left them there and went back to the rock. I felt better just knowing they were praying too. Some time later I came back to where they were and found them sleeping again. Peter had told Me earlier that he would go with Me to death, so I tried to rouse him to ask if he couldn't stay awake with Me for just one hour. He only mumbled something about cold and dark, then turned over and continued sleeping. I know he would have wanted to stay awake had he realized how badly I needed him, but he was just a man, and he was weak. So was I.
I stumbled back to the rock. I pleaded and cried for another way, but there was no answer. It's impossible for Me to tell you just how difficult the struggle was! At one time I was almost to the point of giving up when I thought of Peter and how Satan had desired to have him--and not him only, but all of My friends, the whole human race. I saw the pain and suffering of a world without hope. I saw blood-drenched battle fields strewn with dying. I saw parents grieving for children who were no more. I saw children grieving because their parents would not stay together. I saw endless disease, poverty, slavery, and oppression; the living and dying, weeping and groaning of a world in darkness. I saw the burdens and the burdened of the all the ages, and it was enough. Satan desired them all, but they were not his. I determined to reclaim Pete...and the world! I fell dying to the ground then, and My Father, My dear Father, sent help--a messenger from the world of light. He lifted Me up and showed Me the future results of My death. I was saddened to see that many of the human race would not take the hope offered, but I also saw the redeemed as they stepped through the gates to My Father's house. I saw their gladness and heard their rejoicing. I saw Peter rush to meet and embrace Me, and I was strengthened. It would be worth it all! The ransom price was not too great to pay. The messenger departed, and refreshed, I returned once more to My sleeping friends. I stood for some time looking down at that precious sleeping group. I think I know how a mother feels when she gazes on her sleeping children. The world was waiting for them, and they seemed so vulnerable, so inexperienced. Let them sleep on, I thought. They'll need rest. There are great things in store for them and much to be done. These eleven, with their friends, will turn the world--and Satan's kingdom--upside down! The mob arrived, and the nightmare began. Peter woke with a start and went into immediate action, cutting off an ear. He seemed so confused when I restored the ear to its owner! Like a rabbit at night when surprised by a ray of light, he hesitated, trying to decide whether to freeze or run. He chose to run, and hollering at the other disciples to save themselves, he bolted into the night. I didn't see him again until after My preliminary trial before Annas. He had cautiously made his way back and was mingling with a group around a fire. He didn't know I was watching. Some soldiers formed a circle around Me and began shoving Me about. They put an old feed bag over My head, and I lost sight of Peter, but there was no mistaking his voice. He was shouting vehemently that he did not know Me. They began to hit Me in the face and head and threw punches at My ribs and stomach. One blow caught Me in the mouth, and I felt blood running from My lips. Someone ripped the bag from My head and whirled Me around. He raised a fist, but for one brief moment, through a gap in the crowd, I saw Peter, shouting across the fire at someone who was laughing and pointing at him. Our eyes met. He paused in midbreath, and then the fist struck Me full in the face. When My vision cleared, Peter was gone. You probably know most of what happened after that. The trial, Caiaphas, Herod, Pilate, the floggings, the nails, the cross. Through it all, that last look in Peter's eyes kept coming back to Me. I don't think I have ever seen eyes express pain and sorrow any more than his did then. I knew he was sorry and I wanted terribly to go to him, but it was impossible. I wanted to find him and tell him that it was all right, tell him that everything was going to be all right! The nightmare finally faded to blackness and was finished. The next thing I remember, it was morning! I awoke to blazing light and knew that We had won! Angels were everywhere, and the singing and the glory were beyond words! Gabriel shouted, 'Your Father calls You!' I folded the grave clothes and stepped out into wonder. It took a minute for it all to sink in. Angels and other friends from home were all around, embracing Me and saying I had been victorious. Everyone wanted to talk at once. Oh, it was a glorious reunion! The angels were trying to hurry Me off somewhere when I remembered Peter. I asked the two nearest Me if they would tell My disciples--and Peter--that I would go ahead of them to Galilee and meet them there. Then I thought of Mary. Mary is another story, and I must tell it to you later. Mary would be coming to the grave, and I just had to stay by to meet her. I am so glad I did; she needed Me. Just before I left, I gave her the same message for the disciples and Peter. Homecoming followed, and it was the best! My Father rushed out to meet me and shouted to everyone, 'Rejoice, my Son is coming Home again!' Words fail, but there is a Homecoming planned for you too, and soon you will know just how good it is. It wasn't easy to pull Myself away, but I told My Father I needed to be away for a little while. There was something I really wanted to do. He gave Me a hug and said We'd have lots of time when I got back. He is the source of selflessness! I couldn't wait till Galilee to see Peter again. When he left the trial, he had gone to Gethsemane, to the very rock at which I had prayed. My Father told Me that Peter had been praying to die. Mary got My message to him, and he raced all the way to My empty tomb. When he didn't find Me there, he returned, crestfallen, to Gethsemane. That is where I found him. He was as overjoyed to see Me, as I was to see him! We clung to each other like friends who have been long separated. I'll not share all we talked about during the next couple of hours. They were special, private, meaningful, and we parted, without sadness! When they answered, 'No!' I told them to cast their nets on My side of their boat, which they did. No sooner had they cast than there was a great catch. John shouted, 'It's the Lord!" and Peter dived in to swim for shore. Maybe I'll tell you one thing we talked about during those two hours in Gethsemane. I have an appointment to keep. Peter and I are going sailing on the Sea of Glass!